“In the movie Eat.Pray.Love, Julia Robert’s character explains to her therapist that she has made time for everyone else but has not taken even two weeks to deal with herself.” (excerpt from Organizing Your Prayer Closet). Do you ever feel this way? I bet. Aren’t we always taking care of the others in our life? Whew! Well, I have prepared a place for you to reflect on those things that are on your heart and those things you feel most passionate about. I have one compartment in my structured prayer journal that specifically deals with me. It is titled, “My Heart / My Passion”. It is in this compartment that I pray over ministry (my passion) and those things I am burdened by (my heart). 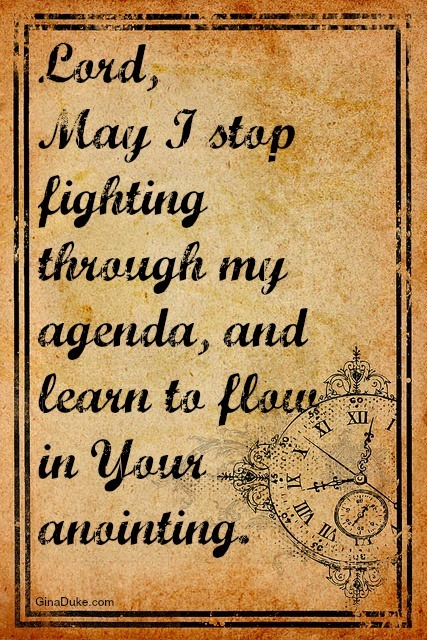 While reviewing this compartment in my prayer journal for this post, I found this entry, “I want to flow in your anointing, not fight through my agenda.” This year, I have a lot of entries about time management (or my lack thereof). I feel like I NEVER have enough time! This has been my burden. Many of my entries have been requests of God to “redeem my time.” I need more than I have right now, as I am in a very busy and demanding season of my life. I am happy to report that God has answered my prayer, and as usual, it was not in the way you would expect one to answer a prayer need for more time. His answer was for me to take a Sabbath Sunday. He impressed upon me to not create content on that day, but to rest. Rest? “God, I am drowning here in ministry work; I can’t afford to even take one afternoon off, much less a whole 24 hour period! “ was my response. But, everywhere I turned I was met with encouragement to take a Sabbath Sunday. If there is one thing I’ve learned from paying close attention to my prayers, it’s that once God shows me something, He is not joking. So, I decided that I would work toward finishing all of my must-do’s on my to-do list in order to rest on Sunday. The day before, I was speaking at a retreat and while in conversation with one of the other speakers I told her that I had been working toward my first Sabbath Sunday all week and was ready, which really gave me a sense of accomplishment. As soon as those words, “a sense of accomplishment” left my mouth, I immediately realized that that was God’s gift to me. He knew that the root cause of my problem was not that I needed more time, but that I needed to feel a sense of accomplishment. I was working 24/7, always feeling behind and near burnout. Now, with the Sabbath Sunday approach to my week, I plan my work toward the Lord’s day, and then on that day, I feel accomplished and I can rest easy! It really makes a difference; I hope you give it a try! If you don’t have a place in your journal for dealing with yourself, then you might want to make space. Tomorrow, we will check our “Ambassador Notes”. Don’t know what that is? 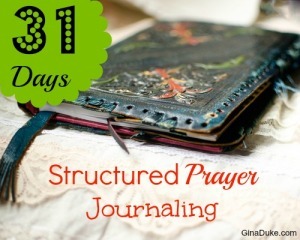 Then come back, and you will see why this is a must for your structured prayer journal!